Keeping it in the family - Mark and Jay O'Shea of rising country music duo O'Shea. Keeping it in the family - Jay and Mark O'Shea of rising country music duo O'Shea. IN popular music there aren't many genres that feature songs or titles about fishing – that is, outside of country music. Fishing and country music have long shared an association and seem to go hand in hand. Over the years big name American country stars like Brad Paisley have released tunes with titles like I'm Gonna Miss Her (The Fishing Song). You don't have to delve far into a country music songbook either to find lyrics about fishing: I can catch catfish from dusk 'til dawn. (Hank Williams Jr. - A Country Boy Can Survive); Smallmouth bass have got me hooked on Sunday afternoons (Eric Church - Love Your Love the Most); I got a brand new rod and reel, got a few weeks off this year (Montgomery Gentry - Lucky Man); All of a sudden going fishing, wasn't such an imposition (Tim McGraw - Live Like You Were Dying). It's also been well documented that some Australian country music stars have a passion for fishing. Troy Cassar Daley is one well known musician who's keen on wetting a line whenever the opportunity arises. " I fish and I drink. I'm a good man I think," Cassar Daley sings on his recent recording 'I Love This Place'. Mark O'Shea is an Australian country music performer on the rise. He's also a keen angler. Mark and his wife Jay make up the aptly named duo O'Shea, a country act that has attracted plenty of interest in their native country and in their adopted US. The couple have lived in the heart of country music, Nashville, Tennessee, since 2007. They make regular trips back to Australia and last year scored the Best New Talent award at Tamworth's Golden Guitar Awards. "We've done a fair bit of touring over there and released a record. We've just come back and are settled now for at least the next four months or so," Mark O'Shea told Fisho recently from Nashville. "I just love the place, it's a great city," he says of his adopted American hometown. "Obviously the music business thing here is pretty big but other than that it's just a really liveable city." FW: So is Nashville the country music capital of the world as they say? "It is, absolutely, but it's also in the last few years it's really become another major music hub ... not just country. There are a bunch of people that have sort of nothing to do with country music that all call Nashville home." According to O'Shea, some of the biggest music acts in the world live in Nashville including Jon Bon Jovi, Sheryl Crow, Kid Rock, The Black Keys, Jack White (White Stripes), Kesha and Ben Folds. "It's a lot less expensive than LA and New York and it's also really a great music community. There are lots of recording studios and it's a sort of hub for songwriting for the world. Everyone who's a songwriter kinda comes here or lives here at some time or another." When the O'Sheas moved to Nashville they had already forged successful solo music careers. They went on to form a duo after discovering out of necessity (to reduce costs Mark played guitar for Jay, and Jay performed backing vocals for Mark) that things just clicked when they worked together. "We were having such a great time, that was something we thought that we'd never do ... we just thought we'd fight too much but that wasn't the case and we're glad." The couple's professional partnership has since gone from strength to strength, culminating with the recent release of their second album One + One, the follow-up to 2011's Mr. and Mrs.
"It came out about a month or so ago and it's been doing really great (in Australia), hence all the trips backwards and forwards. Obviously we moved to Nashville to really give it a serious go over here and at one point we sort of thought, wouldn't it be great if we could just get to a point in our careers where it would pay for us to go home once a year? In the last 18 months I think I've been back nine times, you know," said O'Shea. "It's been going pretty well, and we're very fortunate." Thirty six year old Mark O'Shea grew up in Queensland in Dalby, west of Brisbane, about an hour from Toowoomba. He spent a decade in Sydney before relocating to Los Angeles and eventually on to Nashville. While living in Sydney's inner west he spent time fishing around Sydney Harbour near Haberfield and Drummoyne. While O'Shea doesn't profess to being an expert angler, he says he loves fishing just the same. "I had no idea to be honest!" he says of the species he targeted while fishing Australia's largest city. "I remember pulling a couple of very strange fish from the Harbour there one day. Me and a mate used to scale a fence and jump on to these old boats that were under repair and fish off them, [It was] pretty stupid, we probably could've got arrested for fishing which wouldn't have been that great..."
O'Shea began fishing while growing up thanks to the influence of his older siblings. 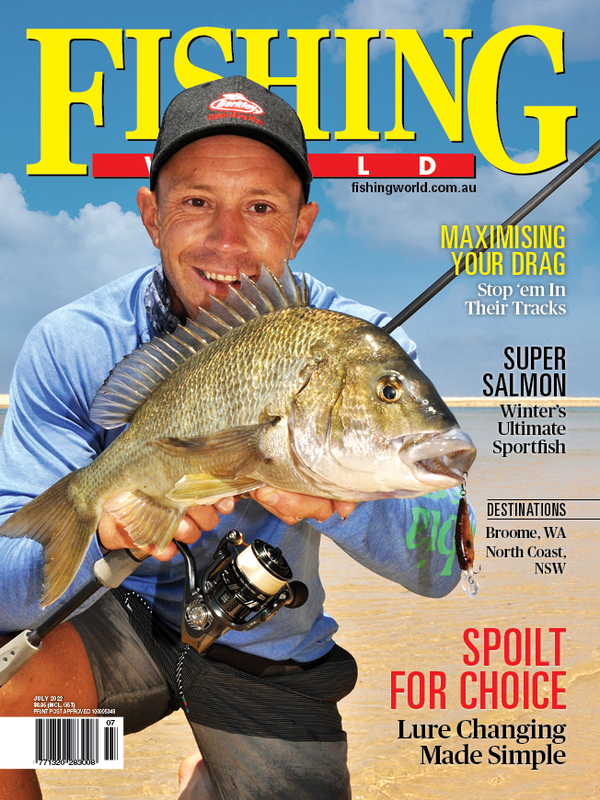 "In the Darling Downs where I'm from around Dalby I just fell in love with it [fishing] at an early age. A couple of my older brothers did it and were very passionate about it and got me hooked. Back then you could catch silver perch or yellowbelly and maybe the odd Murray cod. I never caught one but a couple of people next to me caught them over the years. My brother Richard has a great Murray cod story," he adds. "He was living out at St George and he caught a sixty four [62.5 pounds] pound Murray cod and he never let us forget it, you know. He had the photo up on the wall at home and he's still talking about it now and it's about 25 years ago." Blast from the past - Mark's brother Mark's older brother Richard and his mate, Rob Langford with the 62.5lb Murray Cod they caught in St George, Qld. He also recalls his most memorable fishing experience took place at his brother's mate's farm out near Dalby. "There were plenty of times we went out there and caught nothing and then one time we went out there and ... I dunno if it was just the way that the creek was running, the time of the year or the weather but we had an absolute awesome day ... we must have caught about 25 or 30 fish between us... There were about six of us. We caught yellowbelly, a bunch of jew fish [catfish] and some silver perch. It was a really great catch and I only bring it up because we must have been to that same place probably seven times with ordinary results and this one time it rained fish. It was awesome." These days there are a lot of carp out there which is unfortunate, O'Shea laments. FW: Have you done any fishing in the US? "Like everybody, not as much as I'd like to or as frequently as I'd like to. There's a big lake here in Nashville called Percy Priest. Well there's a couple of lakes, there's Percy Priest and Old Hickory which is another big one as well. We've been out there a few times fishing for bass, both smallmouth and largemouth bass. I haven't caught that many over the years but for me half the fun of fishing is just getting away from everything, turning the phone off, getting dirty and chilling out." Probably typical of many marriages, Mark and Jay O'Shea don't share a passion for fishing. On family holidays he says the couple often "do their own thing" for a day or so which has enabled him in the past to fish exotic locations such as Bali, Noumea and Hawaii. Mark O'Shea with some tilapia caught in Florida. Like many anglers O'Shea has aspirations to fish in Australia's tropics. "I've never been to the Northern Territory barra fishing. That's on the bucket list for sure." Mark and Jay O'Shea promote Australian tourism in the US as part of a program called Friends Of Australia alongside noted Aussies such as Baz Lurhman and The Wiggles. The duo have their own TV show, O'Shea USA, which airs in Australia on Foxtel via the Country Music Channel (CMC). O'Shea says doing the show has been a lot of fun. It has also just been renewed for a third season. The couple also find time for charity work as ambassadors for World Vision and Australian organisation Heart Kids that offers support for families with babies born congenital heart defects. The latter cause inspired the song Thankyou Angels which was No.1 on the CMC Top 50 last week. Mark O'Shea is himself a congenital heart defect survivor. The duo also recently completed a successful Australian tour supporting Sir Cliff Richard. O'Shea can't speak highly enough of the experience of touring with the renowned British singer who first hit the big time in the late 1950s with the Shadows. "He's 72 and has so much energy ... he makes me look like an old man. He jumps around the stage for two hours and he's the nicest guy, he's quite remarkable. We work with a lot of people and sometimes on those tours you don't get a chance to hand with the main act ... not the case with Sir Cliff. We had dinner with him three or four nights and he's just a really great person and it was just a great tour." When asked if the duo has plans to release a fishing song in the future O'Shea says "Well not yet... but never say never. I just have to somehow sneak it by the Mrs. ... which means it'll probably only happen if there's also a song on the next record about shopping." FW: Do you have a favourite fishing related song? "Hands down, I'm Gonna Miss Her by Brad Paisley... and I quote 'I'm sure it'll hit me when I walk through that door tonight ... yeah I'm gonna miss her ... Oh looky there I gotta bite!' But now that I think about it ... there's also Fishin' in the Dark by the Nitty Gritty Dirt Band... and I also like Just Fishin' by Trace Adkins." With the couple expecting the birth of their second child in coming weeks Mark O'Shea says he doesn't foresee a lot of fishing time in the near future. "Unfortunately I think my fishing days are numbered for a little while." O'Shea's new album One Plus One is available now. The duo's third single "Be With You Tonight" will be released around mid June.